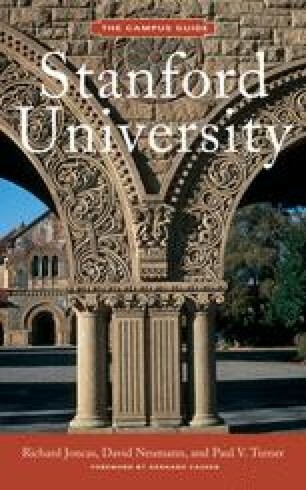 As Stanford University approached its centennial in 1991, much thought was given to both its history and its future. This internal assessment included the evaluation of its original master plan by Frederick Law Olmsted and Leland and Jane Stanford; and its prospective rejuvenation in order to reestablish a sense of unity and harmony that had been lost during several epochs of subsequent building development, each with its own sense of campus planning and related purpose. These development eras range from the Beaux Arts eclecticism of the latter days of Jane Stanford and the extended period of Bakewell and Brown to the later modernism of Church, Warnecke, and Spencer. Each had left its distinctive, yet mostly unrelated, impression on the original order of the campus. Yet such was the power of the original plan, with its strong axial arrangement, emphasizing the relationship of its architecture, landscape, and natural setting, that its intent was still evident to both the casual user and the interested professional, despite its diminished form one hundred years later.